Is this a great name for a shop or what? 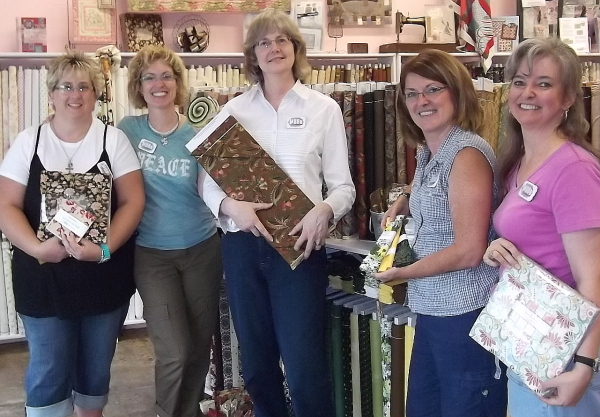 Happiness is Quilting is located in the quant historic town of McKinney, Texas. Laura Kay was one of the first stores to send in a picture of her “moda Certified” team. We will be posting pictures to our Facebook and Twitter accounts along with a link back to you store when you send a picture of you or your staff. If you are not moda certified yet, click on the red moda certifed button and fill out the questionaire. Please send your pictures to lalexander@unitednotions.com. Include store name, names of people in the picture, web adress or any other pertinent information. I wonder if Laura has T-shirts. I think the world needs a Happiness is Quilting t-shirt!